Learn how Montclair's College of Humanities and Social Sciences is using peer mentorship to provide proactive support, expand advising capacity, and increase student success. One of Montclair State University’s fastest growing colleges is the College of Humanities and Social Sciences (CHSS), who welcomes 700+ incoming first-year students each year. With increasing class sizes, student advisors are at capacity. Montclair’s students are largely commuter - most students work while attending school, which can make connecting with an advisor on-campus a challenge. 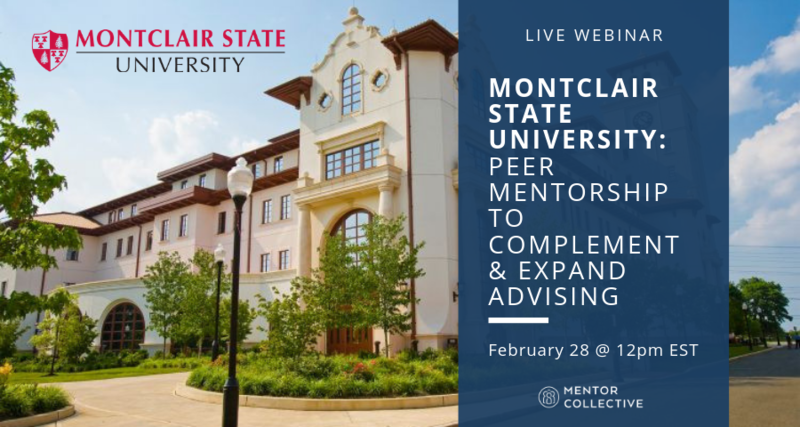 Join CHSS' Dean Robert Friedman and Assistant Dean of Student Services, Courtney Cunningham Thursday, February 28 @ 12pm ET to learn how partnering with Mentor Collective to support each student with a peer mentor has helped advisors connect with their students when it matters most. To attend, or receive a recording of the webinar, please fill out the form below.